For those who like the set-and-forget method of cooking, braising is for you. It’s an especially smart way of infusing a dish with cannabis. Temperatures are low enough to preserve the therapeutic effects of terpenes in cannabis, such as linalool and humulene, which have higher boiling points. Braising’s extended cooking time draws out the potency from weed, even if it hasn’t been decarboxylated. But it’s still best to decarb to ensure the full medical benefits that come from the conversion of THCA to THC. Even with extended cooking times, laboratory testing shows that not all THCA is converted when infusing with non-decarboxylated cannabis. Once the ingredients are compiled and the dish starts its low-maintenance metamorphosis from tough cuts to tender morsels, another change is happening that can benefit the dish. Flavors are developing. If you appreciate cannabis for a wide array of flavors, consider a strain with attributes that complement the ingredients in the recipe. The prominent pine and the subtler notes of sage and pepper that come with Dutch Treat, for example, makes it a candidate for a braise with rosemary, while the orange notes from Tangie make it ideal for braised chicken with citrusy notes. But if you don’t have access to a strain with a complementary profile, or the desired effect overrides a preferred taste, braising is still arguably the best cooking method. Braised dishes typically call for assertive spices and seasonings, leading them to big, bold flavors particularly adept at masking or at least downplaying cannabis flavor. Most people don’t want an overwhelming cannabis taste—at least not in an entire main dish—so I created and tested three braising recipes with that in mind. Chinese spare ribs, for example, feature star anise, orange peel, garlic, ginger, chili and fermented black beans that dominate the flavor profile. For the beef stew, the cannabis is added alongside the rest of the spices and herbs, but there is no hint of an overly weedy taste. The fall vegetables rely on turmeric, smoked paprika, molasses and apple cider to meld the heady flavors into a satisfyingly complex and aromatic dish. Once you determine the recipe and the strain, technique comes into play. Here’s a refresher on braising that will help heighten your cannabis dish. 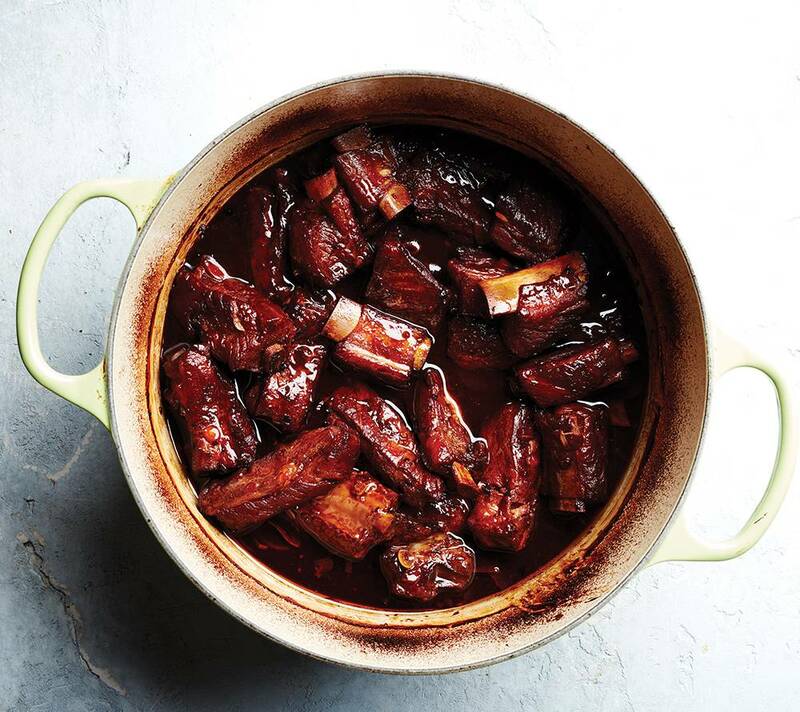 Meat without some fat is not your friend, which is why beef short ribs are enjoying such popularity. For other cuts of beef, go with more marbling than less. Dark meat chicken makes for a good braise but not breast, unless you like the texture of sand. Ingredients that don’t require braising to break down connective tissue need to cook only until they’re cooked through. Overcooking will always result in an unpalatable texture. 2. Use the appropriate cooking vessel. A Dutch oven or a deep, heavy-bottom pan should be in your cooking arsenal. It should hold the contents in a single layer or accommodate enough liquid to cover the ingredients. A tight-fitting lid or a good seal is also necessary. Browning all or most of the surface area of the food caramelizes the ingredients and contributes depth of flavor to the sauce when the pot is deglazed. This step may need to be done in small batches—overcrowding steams the food and prevents browning. 4. Include aromatics and herbs. Remove the seared meat and saute a combination of celery, carrots, onion, leeks and herbs like thyme and oregano. Allow the vegetables to caramelize; this step adds another important layer of flavor. Braising typically calls for a meat, seafood, milk or tomato-based stock fortified with wine, vinegar or citrus. The liquid should rise to the level of the food but not completely cover it. Braise between 275 and 325 F. Turning tough chunks of meat into tender pieces takes time. Rough estimates can be your guide, but fork tender is the goal. Check on the dish halfway through the cooking time. 7. Skim the fat at the start. The THC will attach to the fat, so that means skimming the fat before adding your weed. Braised food tastes better the next day so consider allowing the flavors to meld overnight. Puree the sauce to allow the cannabis to evenly distribute. For Special Spice Spare Ribs, tap here.